point. I could already walk to the park from our apartment. As a last resort, teaching was later outsourced to a friend’s father, who failed at least as miserably. I guess this could become a whole genre. In my case, difficulty with both swimming and bike riding seem pretty alien, since I learned both practically with no effort at a young age (“maybe a day or two” on the bicycle front, according to my mother) — and this despite my roughly 10th percentile aptitude at all things requiring physical coordination. Still, we all have our own demons. 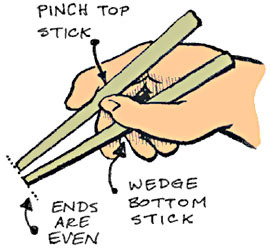 For example, I keep thinking that someday I should learn to use chopsticks. I’ve just never gotten the hang of it, and since restaurants will always bring me a fork if I ask, it’s never been a high priority. Still, maybe someday I’ll tackle it and write a five-part blog post about the experience. I’ll bet you can’t wait, can you?